Create your own gravy that tastes like your mothers. There isn't any tricks, just some patience. Serve over mashed potatoes or noodles alongside your roast. 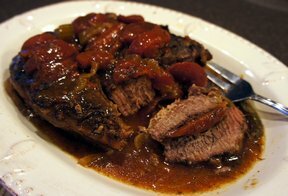 Don't forget to use the leftovers on a hot beef sandwich the next day. Scrape flavoring from sides of roast pan into the drippings. Mix 2 cups cold water and flour until smooth. Add cold water mixture to the drippings. Whisk until all lumps have been dissolved. Keep 1 cup cold water close by to add, just in case gravy becomes thick. Turn heat to medium-high. Bring gravy mixture to a boil, stirring constantly. As mixture boils, it turns a slightly darker color; continue to stir. Gravy too thick? Add cold water a little at a time until it thins out. Gravy will thicken a little as it cools. If it is too thick while it is cooking it may become lumpy. 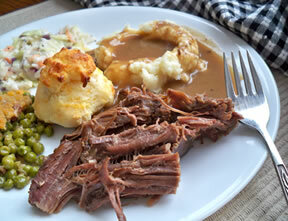 If you do have lumpy gravy, strain out the lumps before serving. 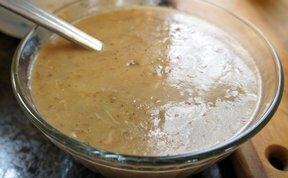 Gravy too thin? Boil a little longer until it thickens. If it is still too thin, mix 2 parts cold water to one part flour. Stir quickly until all lumps have been dissolved and add to gravy, stirring constantly. "Not quite like my wife's but it tasted pretty good. Had to add a lot of salt and pepper. Be sure to combine the flour and cold water and whisk until smooth so you don't have lumps."